New Residents and More at our Senior Campus! This Spring we’re celebrating everything new at our Senior Campus! Many remodeling projects taking place, new team members, and new residents too. The Wellington has now expanded to senior living, including independent living, assisted living, and extended care services. Our new sign, new café seating in the lobby, and remodeled aquarium have been welcome additions by our residents who enjoy playing cards, socializing in the lobby, and greeting newcomers. The fireside room and library also received an update with new furniture and paint. The grounds will be updated with additional landscaping this summer as well. The team at The Wellington has received accolades from residents, owners, and referrals from the medical community. Due to their dedicated level of service and care, the new Care Suites are nearly full, as are our standard living suites and assisted living suites. 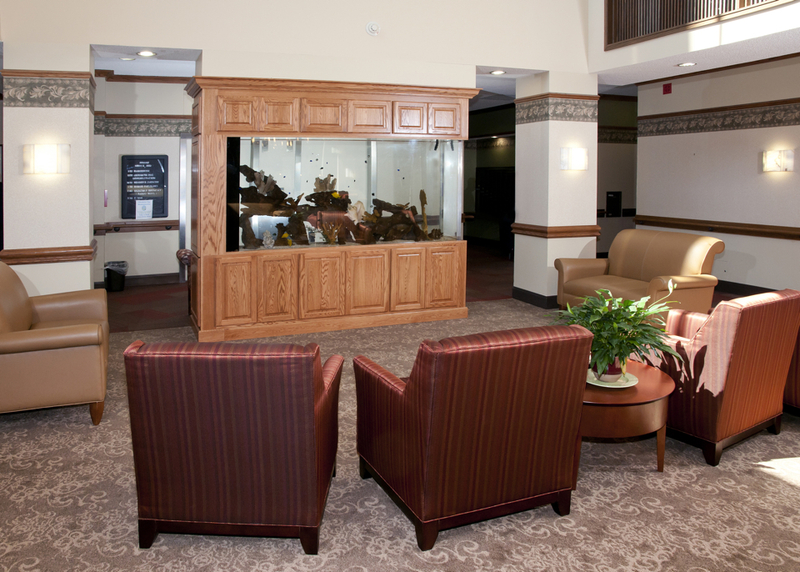 Pictured below is the beautifully remodeled lobby. Many new updates are happening around The Alton as well! The Alton welcomed Mike Lorenz to the team a few shorts months ago, Mike and his dedicated team have developed an extended mission statement to our already award-winning care. We provide a home for individuals with dementia/memory impairment that focuses on relationships rather than tasks. The relationships we encourage consist of our residents, their families and our staff. We all work together as a team to create a community that promotes growth and development that nurtures the human spirit, therefore each resident can be at the highest level of functioning possible. We strive to focus on our residents strengths and not their disabilities. And an occupancy note, 19 of the 25 homes on our newly added 3rd floor are also full. Kudos to the entire team, we appreciate your dedication!